When one satellite is not enough! Satellite TV providers must use more than one satellite in order to provide all of the growing list of channels and services to customers, as a single satellite has a limited capacity. This diagram shows a connection for a customer who wants more than the standard single satellite can provide and who wants to have independent programming selection in two rooms. 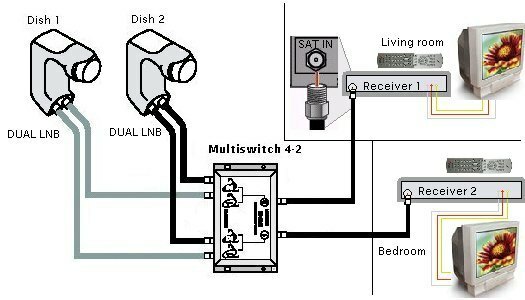 A 4x2 multiswitch is used to allow each receiver to select from 4 LNBs. 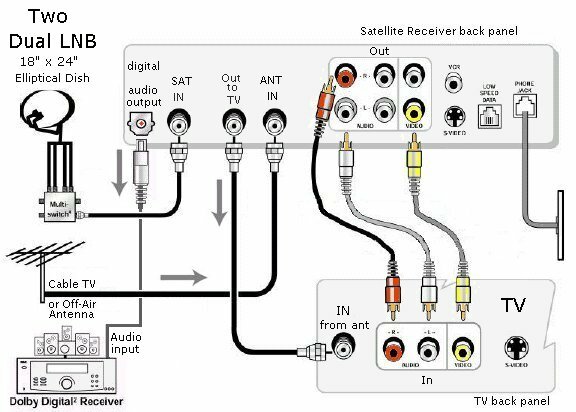 This diagram shows the cable hookups for a satellite TV receiver. Video output from the receiver to the TV can be a yellow composite video or a black S-Video connection. Analog audio output uses a red and white cable combination. For multi-channel digital audio such as Dolby Digital 5.1 surround sound available in DBS signals, use a audio receiver (home theater) with a Dolby decoder and six loudspeakers. A optical or a RCA digital audio cable can be used. For High Definition TV (HDTV) you will need a digital TV capable of 720p or 1080i resolution (or very close to that), plus a HD dish antenna configuration pointed at the HD satellite of your DBS provider and the HD service from your provider. You also need a HD satellite TV receiver with component video, DVI or HDMI output jacks as one of these connections is required in order to send High-Def signals to your HDTV.